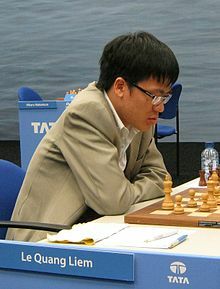 Lê Quang Liêm (born 13 March 1991) is a Vietnamese chess grandmaster and the 2013 World Blitz Chess Champion. He was the Under-14 World Youth Chess Champion in July 2005. He competed for Vietnam at the Chess Olympiads in 2006, 2008, 2010,2012 and 2014. In particular, his 8/10 score on board 1 at the 2012 Chess Olympiad anchored the Vietnamese men's team to No. 7 in the final standing, the highest ever for Vietnam. Vietnam entered the Olympiad ranked No. 27. As of the January 2012 FIDE rankings, he was the 29th ranked active player in the world. He is currently the number-one ranked player in Vietnam. During August-September, he won the 1st Dragon Capital Vietnam chess open with 7/9. In September, he won the 4th Kolkata Open Chess Tournament ahead of 13 higher-rated players. In December, Le with Vietnamese team won the silver prize at Tata Steel Asian Team Chess Championship in India, behind the host India. His personal performance is +4=1-1. In February, Le participated in the Moscow Open tournament in Moscow, Russia. With +5=4 performance, he tied for 1st-4th with Konstantin Chernyshov, Evgeny Bareev and Ernesto Inarkiev. Immediately after the Moscow open at the same venue, Le won the 9th Aeroflot Open with 7/9 (+5=4), earning him an invitation to the Dortmund Sparkassen Chess Meeting. From July 15 through the 25th, he took part in his first elite invitational tournament in Dortmund, in a field consisting of nine-time Dortmund champion and former World Champion Vladimir Kramnik, world No. 6 Shakhriyar Mamedyarov, former FIDE world champion Ruslan Ponomariov, 2004 World Chess Championship challenger Peter Leko, and one-time Dortmund champion Arkadij Naiditsch. Facing Kramnik with the black pieces in the opening round, Le held the former world champion to a draw, and after defeating the eventual winner Ponomariov in round 4, and Leko in round 5, Le finished with five consecutive draws to secure clear second place with 5 1⁄2/10 (+2=7-1) and a performance rating of 2776. From August 28 to September 3, he participated in 1st Campomanes Memorial Cup Open in the Philippines. His final score was 7/9 (+5=4), a shared first place with GM Zhao Jun of China. However, GM Le yielded the crown to GM Zhao via tiebreak score. From 20 September to 4 October at Khanty-Mansik, Russia, Le with the other Vietnamese players took part in 39th World Team Championship. Sitting at table 1, Le played poorly with +2=7-2. From February 7 to February 18, he once again participated in Aeroflot Open and successfully defended the title. His score was 6 1⁄2/9, a shared first place with GM Nikita Vitiugov and GM Evgeny Tomashevsky. He is the only player to have won Aeroflot Open twice. His win automatically qualifies him for a return invitation to the Dortmund Invitational, where he competed in a field that included Vladimir Kramnik, Hikaru Nakamura, and Ruslan Ponomariov among others. From May 10 to May 21, he was invited to play in the Elite Group of Capablanca Memorial Tournament, a very strong field of players (FIDE category 19) including reigning champion GM Vassily Ivanchuk, Latin-America's number one GM Leinier Domínguez, Czech Republic's number one GM David Navara, GM Lázaro Bruzón of Cuba and GM Dmitry Andreikin of Russia. After the final round defeat to Ivanchuk, his score was 6 1⁄2/10, a shared first place but ranked second after GM Ivanchuk via tiebreak score. From October 12 to October 21, he once again participated in the 2012 SPICE Cup, the highest rated international invitational round robin tournament in US history (FIDE category 18) including Maxime Vachier-Lagrave, Ding Liren, Wesley So, Georg Meier, and Csaba Balogh. He was undefeated but finished in a tie for 2nd with Ding Liren, 1/2 point behind the winner Maxime Vachier-Lagrave. After the tournament, he accepted a 4-year scholarship to attend Webster University, starting in August 2013. From March 19 to March 24, he once again participated in the 2013 HD Bank Cup Open, the highest rated international open tournament in Vietnam, including Ferenc Berkes (Elo 2702), Yu Yangyi (Elo 2696), Nguyen Ngoc Truong Son (Elo 2647), Zhou Jianchao (Elo 2595) and other foreign chess players. He was undefeated with six wins, three draws, scoring 7 1⁄2/9 and winning the tournament. From May 16 to May 26, he participated in the 2013 Asian Continental Chess Championships which was held in Philippines. He finished at 4th with 6 1⁄2/9 in the classical part and won the blitz part with 8 1⁄2/9. From June 6 to June 8, he took part in the 2013 World Rapid Chess Championship, held in Khanty-Mansiysk, Russia. He finished 4th, with 10/15, behind Mamedyarov (11 1⁄2/15), Nepomniachtchi (11/15) and Grischuk (10 1⁄2/15). After that he participated in World Blitz Chess Championship, which he won, scoring 20 1⁄2/30. He is the first Vietnamese athlete to achieve the world champion title. From June 15 to June 20 Le participated in the 2014 World Rapid and Blitz Championship in Dubai, UAE as the defending champion in blitz. At blitz Liem finished fourth with +12=4-5, behind the new champion Magnus Carlsen, Ian Nepomniachtchi and Hikaru Nakamura. At rapid Liem finished 19th with +7=4-4. From 2 to 15 August, Le, Nguyen Ngoc Truong Son, and other Vietnamese chess players participated in 2014 Chess Olympiad in Tromsø, Norway. With +3-2=5 result at board 1 (lost to Michael Adams and Francisco Vallejo), Le lost 4 Elo rating points.